Woodworking Crafts: What were your feelings when we were finally able to reveal that you would actually be writing for a brand new woodworking magazine? Amber Bailey: I was very excited. It is going to give much wider scope for content in general and for what I can contribute as a writer. WWC: Can you tell us briefly about your working background and how your 'skill set' suits the new magazine format? AB: I am a furniture conservation and restoration graduate that now specialises in marquetry. Woodworking is very much 'in the family', with my dad as editor of the new magazine I have always had the opportunity to learn from him, but I focus much more on decorative arts. WWC: Bearing in mind there are already other woodworking magazines on the market, why do you think we need another one? AB: The new magazine is allowing for the shift in woodworking trends. The new magazine is taking into account lifestyles and living arrangements of today and woodwork doesn't always have to be serious machinery reliant. 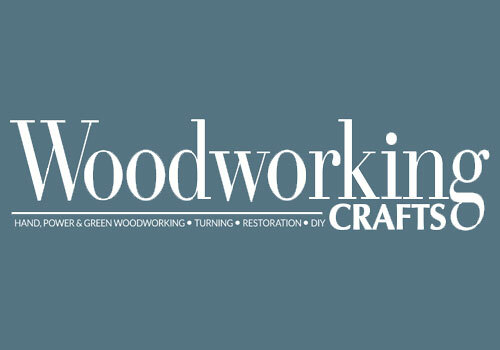 WWC: From what you have so far learnt about Woodworking Crafts - before it has even been published - do you think it is the right publication for today's enthusiast? AB: Woodworkers today are looking for inspiration, creative tips and tricks that they can apply to there own work. The new magazine will be a light and easy read that can be an important reference to enthusiasts. WWC: What do you enjoy most about woodworking or associated crafts and interests? AB: Everything! I am definitely a collector of things, for me there is nothing better than being surrounded by old tools or veneer. I also love that there is a purpose to woodwork. Projects are made with intent, be it functional or aesthetic, it doesn't need heavy meaning and can just be enjoyed. WWC: Do you think a magazine about woodworking should be educational, fun or both? AB: I, for one, love research and getting stuck into heavy books to try and absorb as much information as possible, but if you were to make a magazine too information heavy then it would be near impossible to try and remember anything useful thing that you have read. For a magazine it needs to be fun to be accessible to the readers but education is very important. WWC: Are there particular topics that you are keen to bring to our readers attention? AB: For me an emphasis on tips and tricks is very important. People don't always need to be walked through everything single thing they do, its all about common sense and many woodworkers are self taught. It's the useful snippets of information that can really make a difference for things to be quicker or run smoother. Bob Adsett: I felt an interesting new dimension to life as I was about to retire from promoting Lamello for the last 5 years. BA: I spent my early years in the furniture industry, then the building industry before joining the Kity team. Then, after moving between importing CMT Tooling and then rejoining Kity, I then took 3 months off when Stayer Italy went bust. I then joined Jet Tools and Machinery - which later became Brimarc Tools and Machinery on the purchase of Brimarc Associates to develop the CMT brand. After this I was asked to look after Lamello until I retired. BA: Some of the existing ones are getting old hat and this is an opportunity to put a new life into the arena. BA: Hopefully, with Anthony Bailey as editor, he has had number of years in this market and has lots of fresh up-to-date ideas. It should appeal to all ages of reader. BA: It never stand still, there are always new ideas and products being developed. BA: Besides woodworking tools and machinery, I have talked to Anthony about one or two, but not yet finalised the agenda. Gary Marshall: Pleasantly surprised and pleased that my articles seem to fit in with the new mag's ethos. GM: As a conservationist with a lifelong interest in woodlands and trees I'm keen to link users of woodland products with an understanding of the living forest. GM: To provide encouragement and interest to aspiring woodworkers, existing craftsmen and specialist timber and woodland material producers, including small woodland owners. GM: I would hope so. GM: Knowing what tree is what and what traditionally each timber is useful for - but my interests go far further than that. I believe woods are important from the soil in which they grow, through micro-organisms and fungi in leaf litter, for the plants that they support in the ground flora, for all the wildlife they support; for their visual, cultural and spiritual appeal and right up into the branches which support myriads of insects, birds, bats etc. I could go on - but that's a separate article! GM: Both - interesting, stimulating, encouraging and fun. Humour and/or surprise is a great way of engaging readers. Visual appeal through photos too. GM: Observation, using all one's senses. Geoffrey Laycock: The opportunity to be involved with a new publication comes along rarely, so it's exciting to be part of the new title and maybe in a small way help to shape the new magazines future. GL: From a young age I have tinkered with anything mechanical and also worked with wood, so I have many years of mixing the two together. Sometimes that does become interesting as I have a tendency to try working with engineering tolerances in wood but it does mean I can see lots of opportunities for skills and tools crossover from one discipline to the other. I enjoy undertaking tool and machine reviews especially as I can look at their use from an ergonomics, safety and users points of view. GL: There are quite a few woodworking magazines around but Woodworking Crafts promises to have a much broader potential audience and bring a much wider range of ideas and potential new skills to readers. GL: I believe Woodworking Crafts is right on the money! Today's interest in crafts of all kinds and the increasing availability of materials, supplies and specialist tools makes it easier than ever for anyone to 'have a go' and if we can undertake the role of an enthusiastic support resource who knows what can happen. GL: I love the smell of wood and engine oil, the texture of metal, wood and art glass, especially if I can combine all three in what I'm doing. I love to create and to make for others, as gifts and sometimes for remuneration, and a huge smile can be the most amazing thank you for something given that took two days to make and the only thing wanted in return. GL: Woodworking magazines should be educational, informative, give a guiding and inspiring hand to readers but very definitely with fun mixed in, wherever possible. GL: If I didn't say 'safety' it would be strange but it's not what readers want all the time. I hope to write about ergonomics in tool design, maybe history of tools and introducing new tools and skills. I am also interested in green woodworking, I want to convince people to try pole lathe turning and use natural wood. Louise Biggs: Having written only five articles for Woodworking Plans & Projects it's sad to see the end of a title, but I'm excited and very proud that I have been asked to write for Woodworking Crafts from issue one and my thanks go to the people concerned for the opportunity. LB: I trained at the London College of Furniture and spent over 14 years with a London company who dealt with London's top interior designers and antique dealers before starting my own business. I have worked on an extensive range of furniture both making and restoring, which should enable me to bring a varied range of projects and skills to the new magazine to suit all skill levels for as long as I am asked. LB: As Woodworking Crafts is replacing the old title I think there's certainly room for a new title, especially as its approaching woodcrafts from a slightly different angle. LB: From what I've seen and what I've been told I certainly think it is. LB: Probably the fact that I am working with wood with all its different grains and colours and the many varied ways in which it can be used. I'm constantly trying to find the time to do more 'decorative' turning and then there's the carving, that's still to be improved on. LB: Definitely both. If you're having a go at any woodworking discipline it must be because you want to, so it should be fun and from that we all learn. LB: I cannot think of anything in particular, but if people learn from my writing then I guess the article succeeds. Michael T Collins: Excitement - it's always good to be a part of something new! MTC: In my previous life I was a teacher and realised many years ago that students learn at different rates and in different ways - teaching styles have to adapt to the audience and new format lends itself to offering different ways of getting techniques across. MTC: Too many existing magazines assume you have a certain skill set and there is very little out there for the first-time woodworker. Woodworking Crafts fills that gap. MTC: It's probably one of the most relaxing and stress free things I do! MTC: Continuing to introduce basic skills and techniques - letting readers know that they can do this. Neil Lawton: I haven't told anybody yet! NL: My work as a Design and Technology Technician includes machine maintenance, the teaching of safe use of woodworking machinery and 'one-on-one' work with students to help in the construction of their designs. I still work in the school part-time, but spend my home working days producing items from reclaimed or self-seasoned timber. NL: There is never a 'one size fits all'. NL: The title alone is very promising. NL: Turning what most would consider fire wood, in to usable items. NL: Reclamation in a world of waste is close to my heart. So, now you know what our authors think, be sure to pick up a copy of Woodworking Crafts! On sale 14 May, 2015.